When you arrive at the ABC facility(by Bus), please go to the orientation location to get guidance from the ABC staff. Please listen to the ABC facility introductions that explains the meeting place for each activity, and also gives customer recommendations. After the orientation is over, a wristband will be given to the customer. Reservation times for the major activities are also listed on the wristband. If you use a locker, please get the locker key at the gift shop and deposit your bags/luggage that should be stored. If you are changing to a bathing suit please use the changing room. If you would like to add activities to your reservation activities, then please come to the reservation counter that is located at the back of the gift shop. 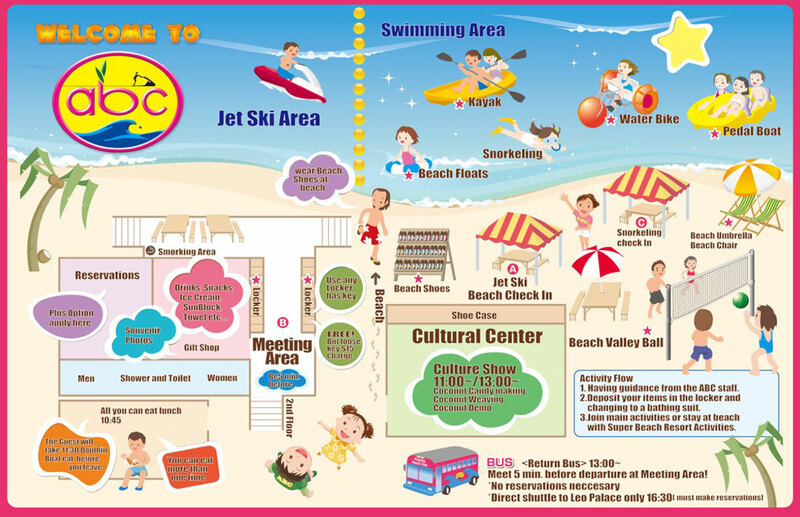 For activities to be carried out at the beachfront(Jet ski, kids banana boat, etc. ), please go to the tent located at the beachfront near the jet ski area. You can schedule your desired time for your activity. You can use kayaks, pedal boats, beach chairs, beach umbrellas, etc. that are available at the ABC Super Beach Resort freely. Scheduling is not necessary. For other questions please contact the beach staff.